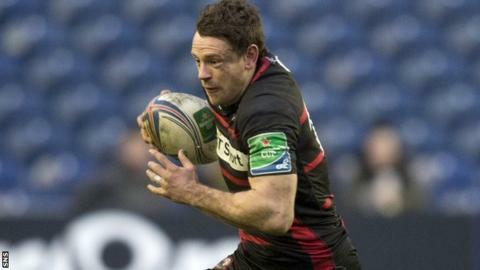 Edinburgh and Scotland centre Nick De Luca will join French Top 14 side Biarritz at the end of the season. The 30-year-old has made 125 appearances for Edinburgh and won 41 international caps. Edinburgh head coach Alan Solomons said: "It will be reinvigorating for him, while it opens up opportunities for others in the club." Young Scottish centres Michael Tait and Chris Dean have already signed for the Pro12 club for next season. Dumfries-born De Luca began his career at Edinburgh in 2005 and, apart from a single season at Border Reivers in 2006-07, has been at Murrayfield since. He made his Scotland debut against France during the 2008 Six Nations. De Luca said: "I will always be proud of my time here and leave with no regrets. I respect the club in their decision to move in a different direction and I wish the young Scottish lads all the best coming through." Solomons said: "There comes a time in a player's career sometimes, especially when you've been at a club for a long period, that you realise you could benefit from something fresh and new. "Nick has been a great servant of the club over the years and we wish him the very best."